If you're one of those guys that can never seem to find clothes that fit your height or weight, then David Big and Tall, online at Davisbigandtall.com, is the perfect store for you to shop at. Davis Big and Tall offers a variety of apparel in sizes that will fit the big men. Davis Big and Tall offers everything from shorts, shirts, suits, blazers, to swimsuits, underwear, activewear, and so much more. Davis Big and Tall ensures trust with all its popular brands including Columbia, Wrangler, Russell Athletics, Chaps, Carhartt, New Balance, and so much more. So check out the big and tall clothes at Davis Big and Tall. But remember to stop by RetailSteal first to find the best Davis Big and Tall coupon codes, Davis Big and Tall promotions, and Davis Big and Tall discounts. Get free shipping within the US on orders over $99 from Davis Big and Tall. Choose from Ground Shipping, 2nd Day Air, and Next Day Air. Davis Big and Tall only ships to US territories. See website for full details, exclusions may apply. Save 15% on purchases of $500 or more online at Davis Men's Store today when you enter our coupon code at checkout. Shop at Davis Men's Store and enjoy 10% savings on your first order. Click here for code. Hurry over to Davisbigandtall.com and save 5% discount on every purchase $75 and more with this coupon code. 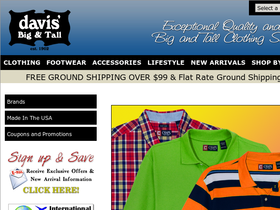 Shop at Davis Men's Store: Big & Tall and enjoy 50% savings on 2nd day air shipping of orders $150+. Click here for code. Shop online at Davis Big & Tall and enjoy a 10% discount on your order of $250+ with this coupon code. Shop at Davis Men's Store: Big & Tall and enjoy 15% savings on 2+ Long Sleeve Sports Shirts. Click here for code. Save up to 70% on clearance items at Davis Men's Store Big & Tall. Click link to save. Use our coupon code at Davis Men's Store to save $25 on purchases of $250 or more. Save an extra 10% on camo sale purchases of $125 or more when you use our coupon code at Davis Men's Store. Save an extra 15% on your Davis Men's Store: Big & Tall purchase when you buy 4 overalls and use this promo code! Use our coupon code at Davis Men's Store to save $60 on purchases of $395 or more. Click our link to shop now. Buy a North End outerwear item and receive another for 10% off. Just use this coupon code at Davis Men's Store. Enjoy free shipping on your Davis Men's Store: Big & Tall purchase of $75 or more with this coupon code! Cilck our link to shop online at Davis Men's Store and enjoy 10% extra savings on select sale merchandise when you use our coupon code.